More than 18,500 Vita CR Systems have been sold throughout the world, making Carestream your trusted source for desktop CR. Carestream�s DIRECTVIEW CR systems are designed to streamline patient throughput, speed work�flow and increase cost-efficiency. Three computed radiography models allow you to choose the plates-per-hour performance that matches your facility�s needs. We also offer both single- and multiple-cassette capability. Whatever your CR choice, you can count on excellent image quality, a space-saving footprint and easy, user-friendly operation. Improve Your Workflow & Boost Productivity with this Compact, Single-Cassette CR System. Carestream's DirectView Classic CR System is easy to use and fits almost anywhere. This robust distributed CR system produces high-quality images and has a footprint that allows placement in an x-ray room or control console room. The DirectView Classic CR System utilizes the industry standard for cassette sizes, including 15 x 30 cm for dental imaging, and 35 x 84 cm for long-length imaging. Ideal for a wide range of environments from hospitals and clinics to private practices, the Carestream DirectView Classic CR System is designed for central and distributed CR applications where rapid image availability, high image quality, lower costs and benchmark productivity are critical. With less capital investment and lower operating costs, the Carestream DirectView Elite CR System helps imaging facilities realize financial goals. 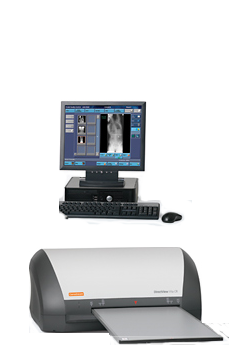 It is designed for medium to high imaging volumes in Hospitals, Diagnostic Imaging Centers or Clinics, Specialty Clinics/Private Practices (e.g. Orthopedic Clinics) and Large General Private Practices. Carestream's Elite CR System provides a variety of capabilities that are designed to enhance productivity, performance, and ROI for healthcare providers of all sizes and complexities. 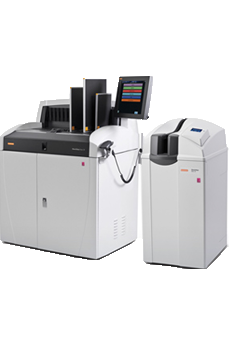 It is designed for distributed and central CR applications where image quality, rapid image availability, lower costs, and high departmental productivity are critical success factors.